1. The following accepted papers in the 15th IEEE Latin American Robotics Symposium (LARS) and 6th Brazilian Robotics Symposium (SBR) were selected among the Top 16 and are invited to submit an extended version to the Journal of Intelligent and Robotic Systems. 2. 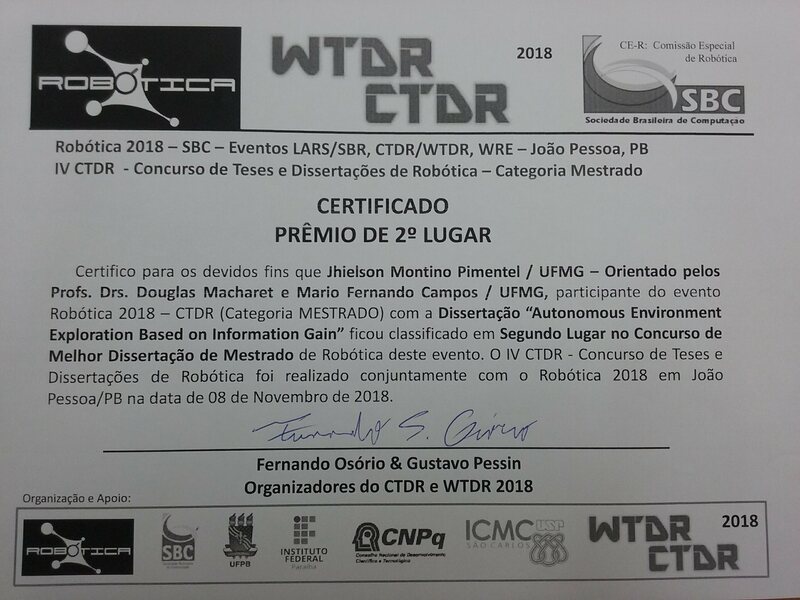 Former student Jhielson Montino Pimentel ranked 2nd Place in the ‘IV Best MSc Dissertation and PhD Thesis Contest in Robotics (CTDR)’ for his work entitled ‘Autonomous Environment Exploration Based on Information Gain’ advised by Profs. Douglas Macharet and Mario Campos.